Ryan Coogler, director of record-breaking movie “Black Panther” has written a letter thanking fans for their love and support for the movie. 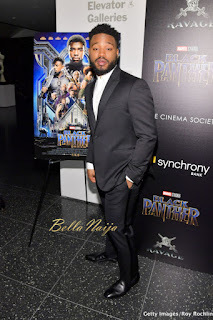 “Never in a million years did we imagine that you all would come out this strong,” Coogler wrote, saying he was struggling to find the words to express just how grateful he is. In the letter posted on Marvel’s Twitter page, Coogler thanked the press and fans too, appreciating everyone for buying tickets, writing about the film, and waiting on a line to see it. “Black Panther” continues to break box office records, raking in an outstanding $240 million in its opening 4-day weekend. Filmmaking is a team sport. And our team was made up [of] amazing people from all over the world who believe in this story. Deep down we all hoped that people would come to see a film about a fictional country on the continent of Africa, made up of a cast of people of African descent.